After a mysterious giant monster attacks New York and continues to rampage across the city, Rob (Michael Stahl-David) and his friends race across Manhattan to try and rescue their friend Beth (Odette Annable) who has been trapped in her high-rise apartment. 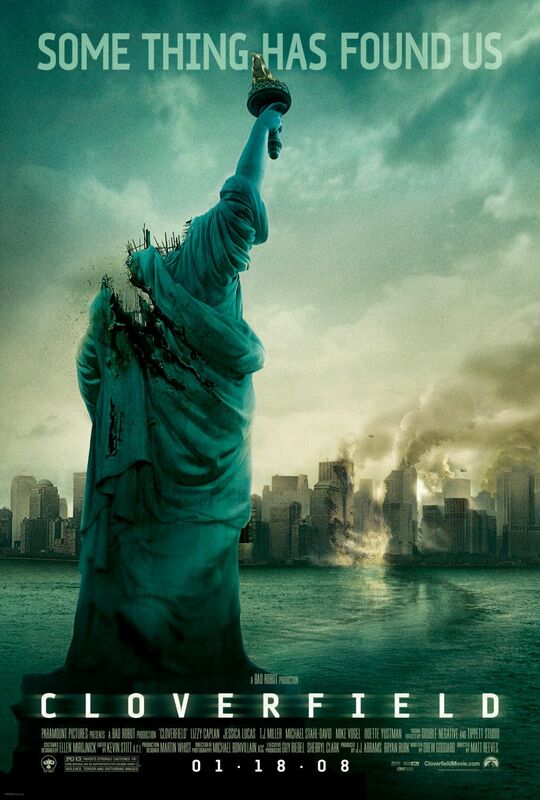 Director Matt Reeves brings a unique found footage sci-fi monster movie with "Cloverfield." We have been quite vocal for our disdain for found footage films as they have has never been our favorite genre. It rarely ever makes sense for characters to carry around a camera all the time filming every aspect of their lives pertinent to whatever story is being told. However, for a situation like what happens in "Cloverfield," there is a bit more believability that someone might want to film the carnage of what's happening on camera. Reeves smartly never uses a score in this film and keeps the run time exactly at the length of a video tape for a camcorder, lending to the desired, authentic feel of such a movie, something that doesn't happen in 98% of found footage films. Some may laugh about us speaking of authenticity in a gigantic monster flick, but within a movie universe where this is an ongoing event, the reactions of the actors seem somewhat authentic. This is not to say "Cloverfield" is without fault because, as is the case with all found footage films, the shaky camera work can be hard on the eyes, dizzying, and may hurt your overall viewing experience. We are also often left with long shots of people's feet and the ground, though we did notice after nearly a decade's worth of these types of movies, we weren't nearly as bothered by it the second time. The monster attacking New York is only shown from a distance at first, so the chaos and destruction are all the more terrifying. This cleverness is not lost on us, and we know this is exactly what director Matt Reeves and producer J.J. Abrams were going for. When its face is finally shown, it actually looks pretty cool, and the special effects are great for a relatively low budget film released in 2008. "Cloverfield" also brought together a pretty good cast, many of which would go on to bigger things, featuring the likes of Lizzy Caplan and Jessica Lucas, as well as brief appearances by future "Sons of Anarchy" star Theo Rossi and Ben Feldman. This movie also served as the feature film debut of TJ Miller, who has gone on to have quite a career, starring as a voice actor in "Big Hero 6" and finding a permanent residence on HBO's "Silicon Valley." This is an exciting sci-fi action thriller that offers some really intense moments. It'ss not so long that you'll get bored watching. In fact, it's the perfect length. It mixes the sci-fi element with the human drama and thrills pretty darn well, and if we had reviewed this when it came out in 2008, we might have said differently. With the influx of found footage films in recent years, we can definitively say this is one of the better, more realistic and purposeful ones. It is a great time as long as you don't get motion sickness from the camera shaking everywhere.